Dr. Huang is an Assistant Professor, Division of Gastroenterology, Mount Sinai Hospital, University of Toronto and Adjunct Professor, Division of Gastroenterology, University of Alberta. She completed medical school and internal medicine residency at Queen’s University, and Gastroenterology fellowship at the University of Toronto. Funded by Alberta Innovates Health Solutions clinician research fellowship, she obtained an Advanced IBD clinical research fellowship and Masters of Science (Medicine) at the University of Alberta where she developed the Northern Alberta Preconception and Pregnancy in IBD clinical research program and continues to direct clinical research. At Mount Sinai Hospital, she is developing the Preconception and Pregnancy in IBD clinical research program for Toronto and Ontario. 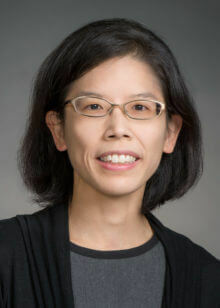 Her primary clinical research interests include using multidisciplinary approaches and e-health strategies to incorporate P4 (predictive, preventive, participatory, personalized) medicine to optimize maternal, fetal, and neonatal outcomes in IBD, and conducting translational studies investigating the impact of maternal IBD and therapies on the fetus and neonate.